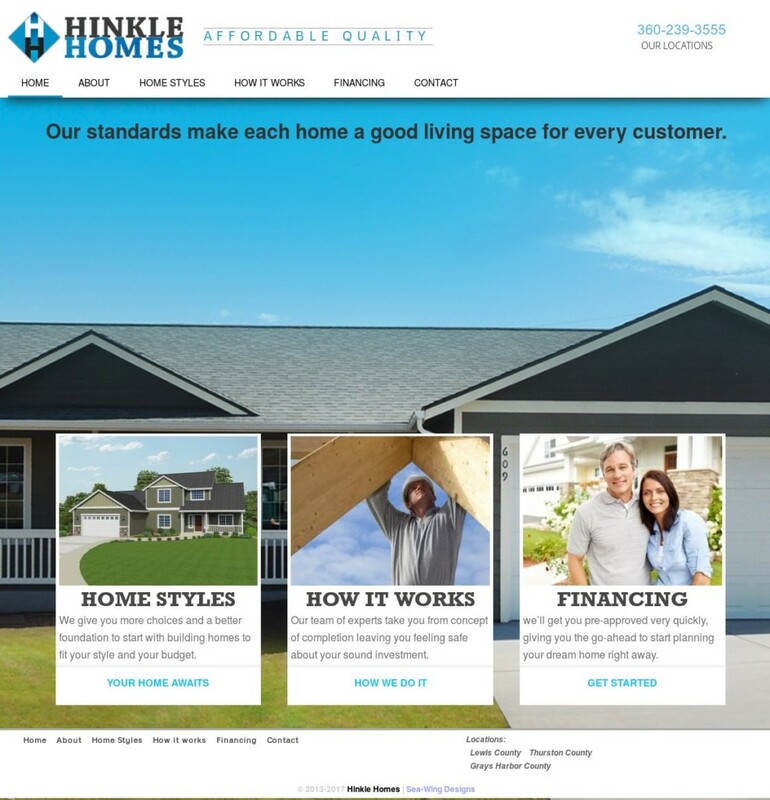 I recently was asked by the owners of Hinkle Hones Inc. to redo the theme for www.hinklehomesinc.com. One of the features of this site is the Floor Plans page that features links to each type of house design the company builds. In addition to rebuilding the theme, Sea-Wing Designs is also providing hosting and monthly site maintenance to keep the site free of malware and up to date. Please take a look and let me know what you think in the comments. 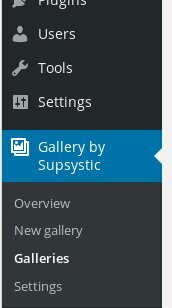 The Supsystic image gallery is a very useful plugin for WordPress. The free version is packed with features and the pro version gives a huge amount of customizations. Once it is installed into your WordPress site, you will want to create a new gallery and upload images. The video below shows you step by step how to add new images to your gallery. That’s it. If you have any questions, please post them in the comment section below. 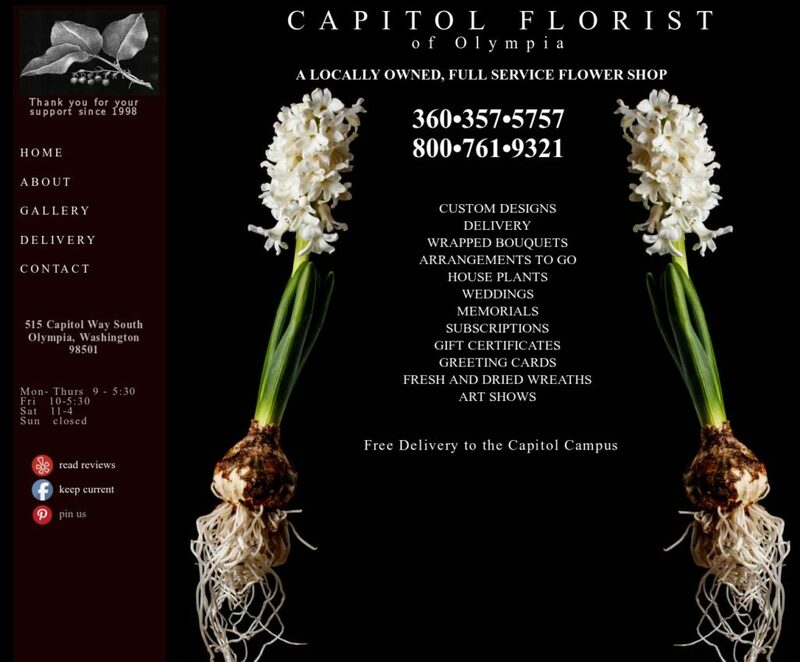 Cynthia Salazar, owner of Capitol Florist – the only flower shop in down town Olympia, needed a website to show off their beautiful seasonal arrangements. She was referred to Sea-Wing Designs by another satisfied client and couldn’t be happier with the decision. We worked closely together to create exactly what she was imagining. The WordPress site is fully responsive to all screen sizes and mobile devices and has a fly-out left column menu for the larger screens. It features a lightbox gallery to display examples of their stunning arrangements. Jason, from Sea-Wing Designs provided training to Cynthia and her staff so that they can continue to update the gallery with current pictures. Please visit CapitolFlorist.com to view their beautiful work. 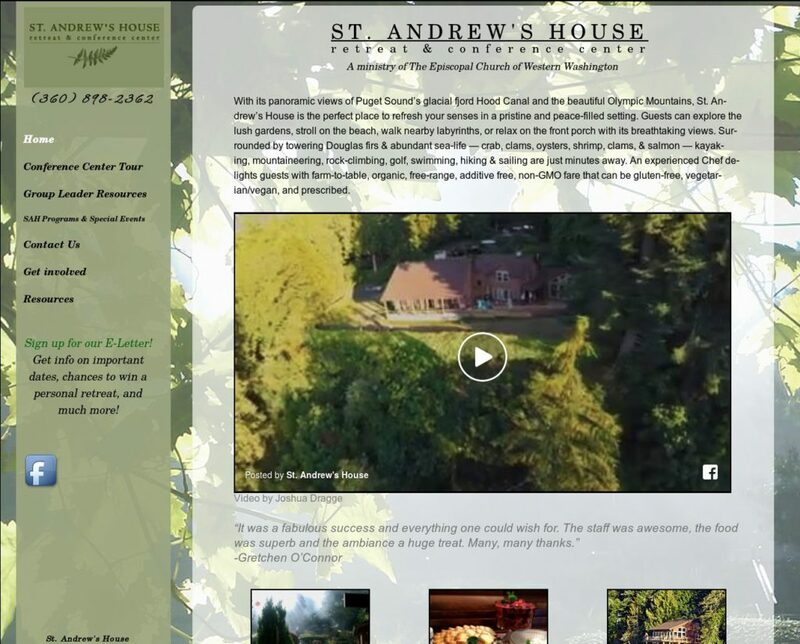 We are proud to announce the Launch of a new website for the Saint Andrew’s House retreat center. The old website was difficult for them to maintain and in need of a new look. The board of directors requested Sea-Wing Designs design and implement a website that would reflect the beauty and peace of the center that they maintain. They are very happy with the results. Following the construction, I was invited to the center to provide a training to the staff and make a presentation to the board of directors. Please take the time to visit their new website SaintAndrewsHouse.org. Please welcome Chehalis Livestock Auction as the latest website designed by Sea-Wing Designs. 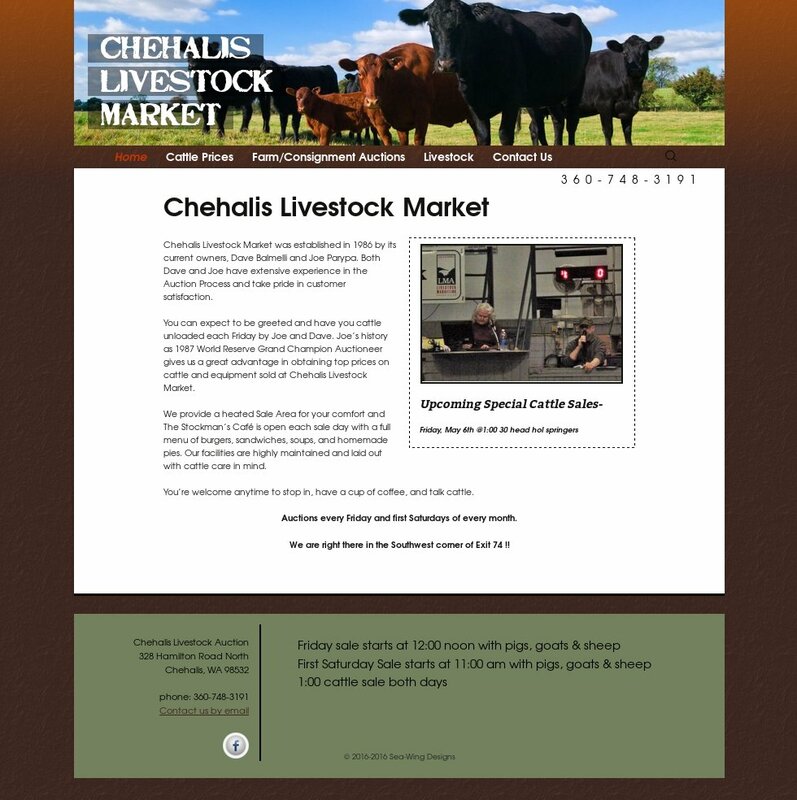 The staff at Chehalis Livestock Market were looking to improve the functionality of their website that they had been using for many years, both for their customers and for their ability to make regular changes to the website. The site includes a changing image box on the front page, updated livestock price lists, an image gallery for their consignment auctions and a Google locator map on the contact form. The design meets their specifications and matches the industry. We decided that we wanted our website to be better—Better looking, better functioning, better access for updates, and better information available timely to our customers. Jason at Sea-Wing Design was recommended to us my our networking technician—-and WOW—we have been very, very pleased. From the initial meeting Jason made us feel comfortable, assured us he could deliver to us an easily accessible website in a timely manner. Along the way we made several changes, which Jason welcomed our ideas and encouraged us to make it how we wanted it. He was patient and professional when we met to learn how to manage our website. Jason continues to be available to answer questions, his fee was also very fair. I would highly recommend Sea-Wing Design to you. Please feel free to call or email us if any questions. 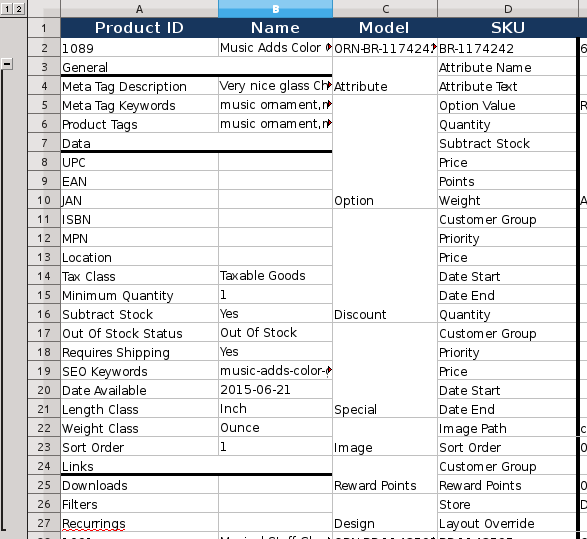 This is a tutorial on editing a group of products in OpenCart using the ExcelPort extension. I will be updating products in OpenCart v2.1.0.2 and using ExcelPort v2.2.2. 1. 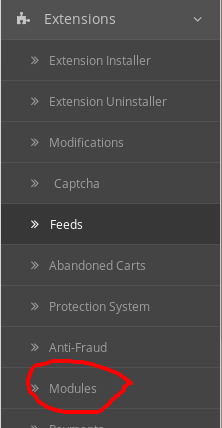 Find the modules link in the left menu in your dashboard. then scroll down to the excelport module and click the edit icon. 2. Check that you are in the “export” tab and check the “products” button. 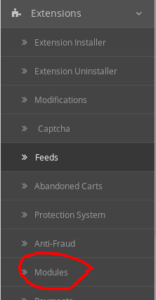 You may create a filter if you want to select only a portion of your products to edit. In this case I chose the model number as the filter so that all products that have a portion of the model number I chose will be exported. You can do the same for price, name, etc. 3. 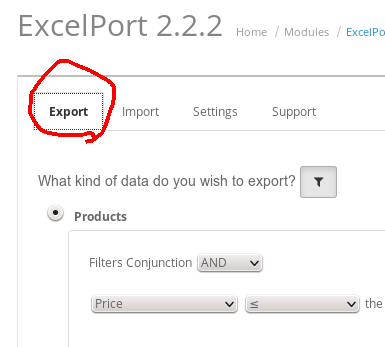 Be sure to leave the quick export button unchecked and click the export button. 4. The a dialog box will pop open and depending on how many products are in your filter, it may take some time to compile. when it is complete you will be given the option to save the zip file on your hard drive. you may rename it to make it easier to find. 5. Navigate to the folder where you saved the zip file and extract the contents of the zip using your favorite zip tool. If there are more than 500 products in your export, there will be more than one .xlsx file contained in the zip. In this case you will have to edit each one separately. There were 37 products in this export. 6. Open the .xlsx file in your spread sheet program such as excel. I use libreoffice calc which works just as well. 7. Each product has an expandable section. 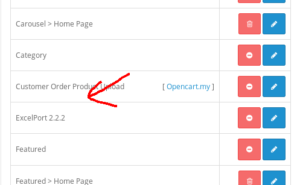 find the small + sing on the left side of the product listing and click on it. This will open all of the settings for that product. be sure to scroll right to see all of the settings. 8. When you have edited all of the products that you need, save the file. It must be saved as a .xlsx file. Do not change any of the field names or alter the format of the spread sheet. 9. Go back to the excelport module page and click on the import tab. 10. Click on the products button, click browse and find the file that you just edited. Leave both check boxes unchecked. 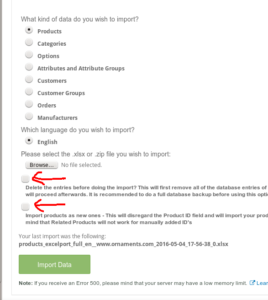 You do not want to delete entries before the import and you do not want to import products as new ones. 11. It is highly recommended to make a database backup before you import the products just in case. 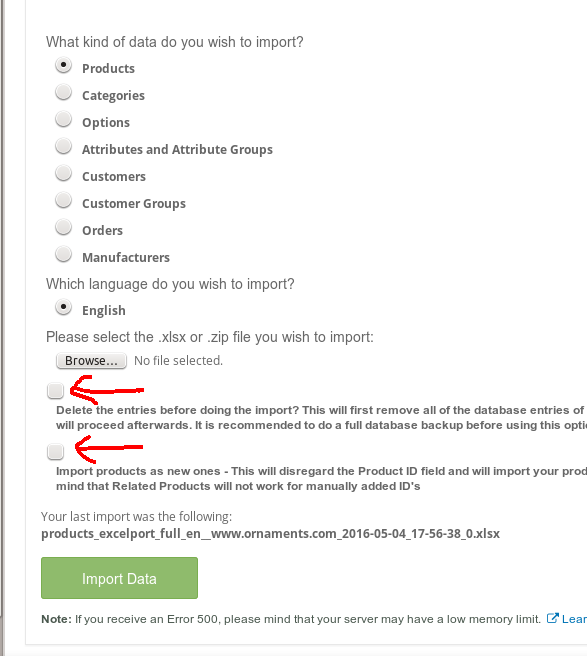 When you are sure you are backed up, you can click import. 12. This should replace all of the products that you edited and not create duplicates. Below is a video that goes into depth on how to enter multiple products. I will create a new post that explains this in more detail. If you have found this tutorial useful or you have any questions, please post your comments below. 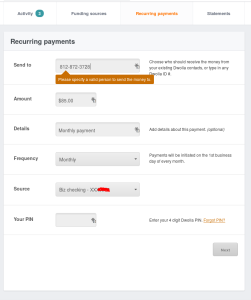 This a quick tutorial on setting up your Dwolla account to make automatic payments. This article assumes that you have already signed up for your free Dwolla account, if you haven’t you can do so at https://www.dwolla.com. You will also need to link your bank account which takes a few days. Go to https://www.dwolla.com/fundingsources and click “Add a funding source”. 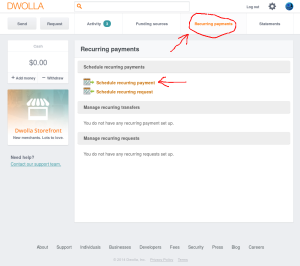 Dwolla will then make two small deposits into your bank account in a few business days and you enter that amount in the verify page. You will receive email instructions on how to do this. 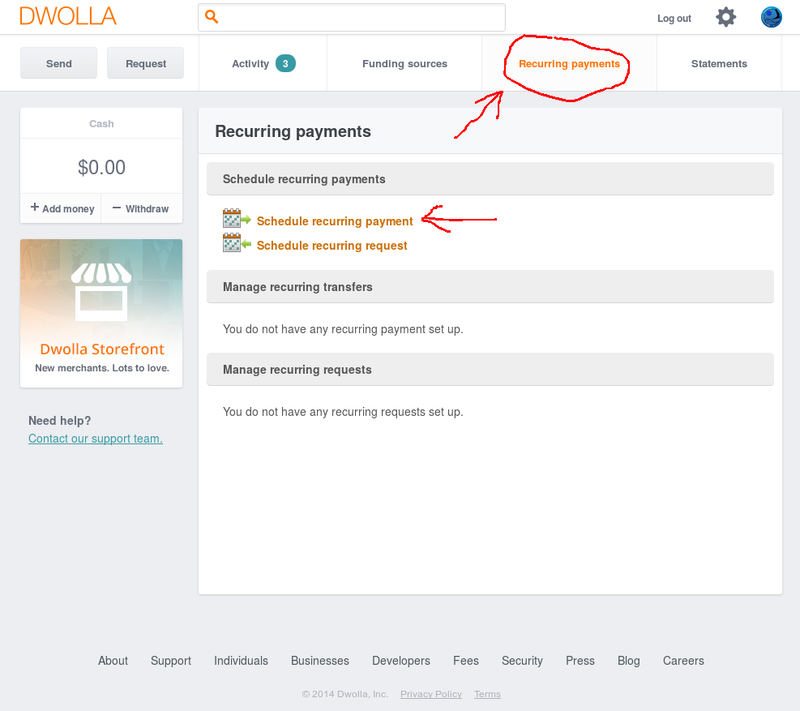 In order to set up an automatic payment that will pay another Dwolla user on a recurring basis, first click on the “Recurring Payments” link in the top menu. Then click on the link in the page that says “Schedule recurring payment” Now you will see the following screen: Fill out this form. If you are sending the payment to Sea-Wing Designs, you can enter 812-872-3728 in the first field, other wise use the id or email of another Dwolla member. Enter the amount that you will be sending. You can add a note about the payment if you want. 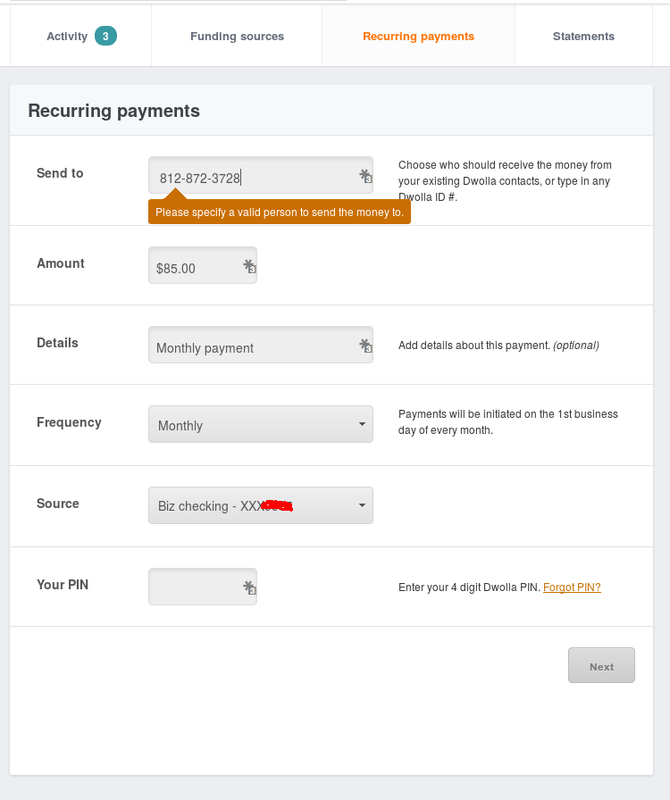 Select how often you will be making the payment; weekly, bi-monthly, or monthly. Choose your bank account if you have verified more than one. Enter your PIN that you created when you set up the account. If you don’t remember it, you can click on the “Forgot PIN?” link and they will email you a new one. The next screen just asks you to confirm your choices and when you do, everything should work just fine. The question is asked occasionally: Why should I pay for someone to build a website when I can just get one for free? This is an important question and the answer really depends on your business model and marketing plan. In this article I will compare using Weebly to create a free website to hiring a designer to build a custom website using WordPress. Lets first talk about the good stuff. 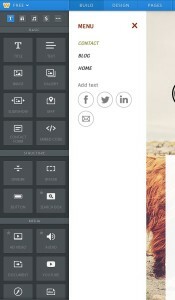 Weebly has made a platform that is extremely easy to use. Setting up an account is simple and does not require anything more than an email address. Once you set up your free account It is right on to building. Drag the element you want on your page and put it where you want. 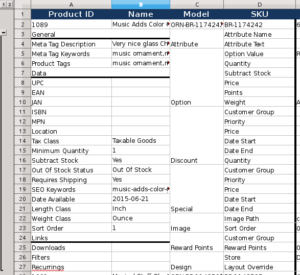 Do you need more than one column, just put elements side by side. Almost anyone with any keyboard and mouse skills can put something together. Next, you go to the design section. Here there is an ample amount of ready made themes available for you to choose from. Maybe you can find one that fits your style. If not you can do some coding and create your own. (maybe hire a designer at this point) In the Pages section you get to create as many pages as you need and set the page lay out for each one. You say you need to sell some products, no problem. Weebly has an e-commerce section too. in the free account you can set up a few. You can also add a photo gallery or a YouTube video as well, all very easy. Since we are talking about the free account there are some limitations you should know about. First, you don’t get your own domain name. You get to be on a Weebly sub-domain (i.e http://YourBusiness.Weebly.com) This is a big concern to businesses who want their customers to remember their web address. If you want to use your own domain name you have to at least upgrade to the basic plan, currently $4.08US per month if you sign up for a year. You also must register a domain name. If you purchase it through weebly you will pay the comparatively high price of $40 per year. The free plan also includes a Weebly ad in the footer of your website until you upgrade. Designing in the free and even basic plan have limits on the tools you can use from the drag and drop menu. If you want to add audio, HD video, or a search bar, you will need to upgrade to the PRO plan (currently $8.25 per month if you sign up a year at a time). And lets say that you need to charge sales tax on those products you want to sell or keep track of inventory or have more than 25 products; now you are required to upgrade to the BUSINESS account, currently $25 per month on the yearly rate. Do you eventually want to add something more complicated like a customer relations manager or an event calender? For now you don’t have that option. After a couple years you may realize that you need to upgrade to something more extensible and at that point you are faced with a challenge of moving all of your site information to a new system. One other possible consideration is that Weebly is a proprietary company. There is no guarantee that they won’t be bought out by a bigger company or go out of business and the “free” service may change or not remain free. Remember, you are doing all of this yourself without the help of a professional designer. Even as simple as Weebly is, there will be a learning curve if you have never worked with it before. Maybe you like what Weebly (or any of the other free site builders) has to offer, but as a business owner, your time is limited and valuable. Most of the time when a new client comes to me to create a website for their business, I recommend going with self hosted WordPress as a content management system. On the surface WordPress looks more complicated and it is, but what that means is power and freedom. 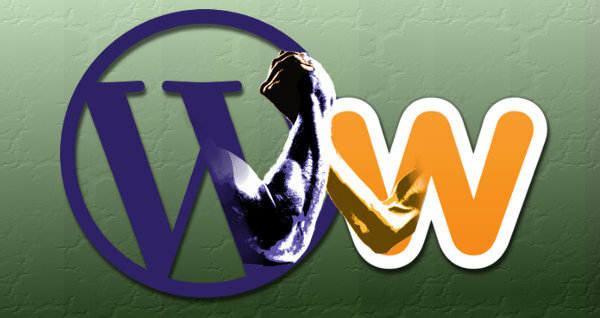 First let me clarify the two kinds of WordPress. As with Weebly, WordPress has a free website version. If you go to www.WordPress.com you can sign up for a free account and have your site going in a very similar way to Weebly. In this article I am discussing the difference between Weebly and a custom designed website and the only way to have a truly customized site is to download the free software from www.WordPress.ORG and install it on a server which means you must pay for hosting. Starting here, having a professional web designer will very helpful. Choosing a quality hosting company as the foundation of your website can’t be overstated and a good designer should be able to guide you away from poor quality. With this in mind, the sky is the limit on what is possible. It is easily something that can start small and grow into something huge. WordPress is simple enough that with a little skill most business owners can get it started on their own. This is where trouble can start. Many times I will have a client come to me and say they have a WordPress site they set up but they just can’t make it work right or it just doesn’t look professional. Many of the themes that are available have their own limitations and without planning ahead you can paint your self into a corner. Not all plugins are created equal either. With that large number of plugins to choose from, there is a lure to use every one you find. Again having a plan and an understanding of how plugins work and how they might conflict with each other is extremely helpful. 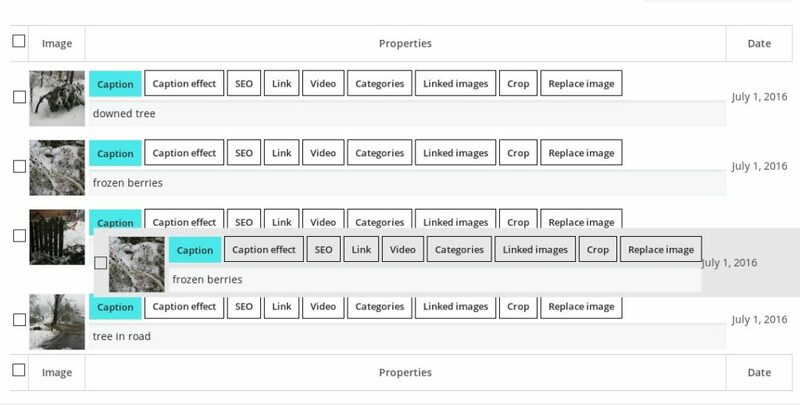 Although there are a couple plugins that offer drag and drop site building capabilities, this is not a native WordPress feature. Creating a custom look for your site generally requires knowledge of HTML and CSS. Hiring a website designer and graphic designer should be considered an investment, therefore take an honest look at your marketing budget. A custom website built on a solid platform can be the difference between looking like an amateur and being a truly competitive professional company. With the right plan and the right tools, your website could be the difference that brings you success. Thank you for taking the time to read this article. I hope that you have found the information useful. If you have questions or comments, please add to the discussion below.